Judge Ted N. Berry is a native Cincinnatian, and the son of Theodore M. Berry the first African American Mayor of Cincinnati. Judge Berry was raised in a family where public service was a virtue, and Ted’s parents instilled in him the values of honesty and integrity with a strong desire to do what is right and fair. 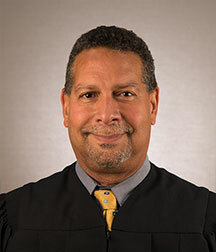 Judge Ted Berry attended North Avondale Elementary, graduated from Loomis-Chaffee School, received a Bachelor of Arts with a Major in History from the University of Pennsylvania, and his Juris Doctorate from the Georgetown University Law Center in Washington, DC. Prior to his election as Judge, Ted Berry was a Law Clerk in the U.S. Attorney’s office for the Southern District of Ohio, worked in the Hamilton County Public Defenders office, served as a Manager in the Labor Relations Department of Cincinnati Bell Telephone, and served as a Trial Attorney representing clients in employment, whistleblower, civil rights, personal injury, product liability and complex tort litigation. Ted Berry also has served as a Trial Attorney for the Allstate Insurance Company, Nationwide Insurance Company, and the Ohio Casualty Group. Judge Ted N. Berry’s civic activities have included the Cincinnati-Hamilton County Community Action Agency Capital Campaign, the Legal Aid Society, Talbert House, and ProKids.